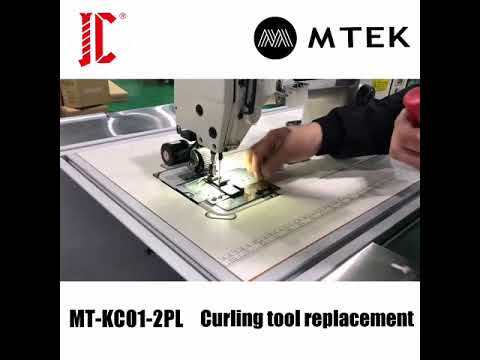 MTEK Multi-function Silicon Edge Sewing Machine series is a special machine for finishing all banners and signs or sew digital textiles with silicone edge graphics, Velcro, and hem. ✔️ It reduces production time and increases output. ✔️ Reasonable structure and user-friendly. ✔️ Operators achieve consistent and high-quality flat seams alignment without ruffling. ✔️ Durable electrical and mechanical designs are safe and reliable. Let us bring your textile finishing to next level. ✔️ The surface of conveyor is upgraded to felt-matte reinforced material, which increase the friction during transfer especially for light weight and smooth fabrics. ✔️ Reverse rewinding of conveyor is added. ✔️ The signal to conveyor movement is collected from sewing head output parameters directly, which makes sure the data completely matached. So the conveyor movement is exactly as the pace of sewing process.